Cordie did not awake until small hands lifted him up and began to stroke him. The plushie Noil began to purr as the speckled Aisha read her book and allowed him to rest peacefully in her lap. So it went. Exhausted and starving, Cordie slept, waking only when a reader would scoop him up, settle him on their laps and pet him. The morning passed and Cordie sighed fitfully, dreaming of food. Tyrannian Victory Day is upon us once again, and you know what that means, a 24-hour long PARTY! 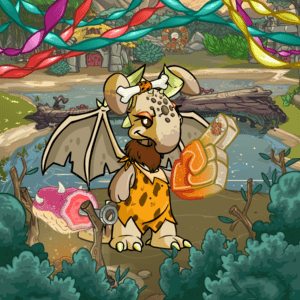 But what does one wear to a Tyrannian Victory Day party, you ask? Wonder no more because I am here to help. This helpful guide will show you a variety of items to wear, and a few to avoid, this Tyrannian Victory Day, all without breaking the bank! Trophies That We Actually Regret! Inspired by the ironic notion of actually REGRETTING one's trophies, I thought I'd write this article! Most Neopians are eager to accrue as many trophies as possible. Yet there are also those motley players who actually REGRET the trophies they own! Here are some of the reasons why we might regret some of our trophies! A lone Whoot winged his way over Meridell. The countryside below was dark. In scholarly Brightvale it was not uncommon for oil lamps to burn late into the night. But Meridellians had no time for such frivolities. They lived off the land, and rose before the break of dawn. So in these hours of darkness, they slept. But tonight was different. At just one point – in a clearing not far from Illusen's glade – a light glowed. The gypsy camp, predictably. Gypsies tended to upset the natural order of things wherever they went. A large fire burned in the gypsy camp tonight. Around it sat a ring of Neopets. Not gypsies, these. No, they were Meridell locals who had come from all the lands 'round about. For tonight was a special night. Tonight, the Teller of Tales would tell the story of the Wandering Lady. A couple of 'pets shivered in the cold night air. The Teller of Tales, an ancient Pteri, pulled her ragged shawl more tightly about her. Its dull brown blended in to the dull purple of her feathers. Apart from the warm crackling of the fire, the night was silent. The motley circle of Neopets around the fire didn't speak a word. Sometimes they gazed mesmerised into the ever-changing flames. At other times, they stared at the peculiar Pteri at the head of the circle. In spite of her old age and her ragged clothes, she hadn't lost any of the beauty of her younger days. Everyone silently awaited the moment when the Teller of Tales would begin her story. But she was in no rush. For a long while, the warm silence stretched. At length, she opened her mouth and croaked “Let me tell you a story of long, long ago.” Every eye in the circle turned to her, rapt. Then, her voice gathering strength as she spoke, she began her narration. It was the year 18 in Neopia and a small litter of new meowclops had wandered through the Haunted Woods toward the magical smell of Faerieland. There were four of them in the family and they had been separated from their mother for a few hours now. The oldest one, Emmett, was just a few minutes older than the others yet he already felt the drive to walk his siblings to safety. His two younger sisters Bala and Mila were beginning to tire, and Fedlimid, his younger brother needed a little push with his nose. Emmett was just about to do so when he heard a rustling that caused him to freeze. He began pushing his siblings forward and they started running, sensing the danger that was near. They got pretty far before they came to a large tree where they felt they could hide, the footsteps getting closer behind them. They ducked down and waited to see what terrifying thing would pop out from behind the brush. “I need my questions answered,” a voice spoke shaking the ground beneath the tiny petpets. Emmett looked around for the speaker but was unable to see very far hiding beneath this huge tree. Soon a quieter voice began to answer, and a body came into view. “I have the answer to your question, Brain Tree” The voice said. An Xweetok stepped into sight. She was wearing a black cloak that made it hard to see her face. “Speak, Mesi the Xweetok,” the Brain Tree answered. Mesi began to speak in a language that Emmett and the other little ones could not understand. The feeling of satisfaction that came off of the Brain Tree they all could feel. “You have quenched my hunger for knowledge, and I have a special prize for you,” The Brain Tree’s voice was terrifying but Mesi did not look shaken. She had done many quests for the Brain Tree and had been waiting to deliver this knowledge until the right moment had come.